Accredited veterans service officers are the key to good service and are supposed to be experts at helping veterans get the benefits they deserve — county, state, or federal. NOTE: As a matter of policy, because we believe there is a need for face-to-face service at times and especially during the first interview for a claim, we do not list organizations who do not provide veterans claims officers to the Lehigh Valley on this page. Little known, the Office of Veterans Affairs (OVA) from the Department of Military and Veterans Affairs for the Commonwealth of Pennsylvania provides a few accredited service officers of its own. In fact, OVA now certifies most county directors of veterans affairs for accreditation by the Department of Veterans Affairs; and its state service officers actually represent them at the Philadelphia VA Regional Office, where your claim goes. 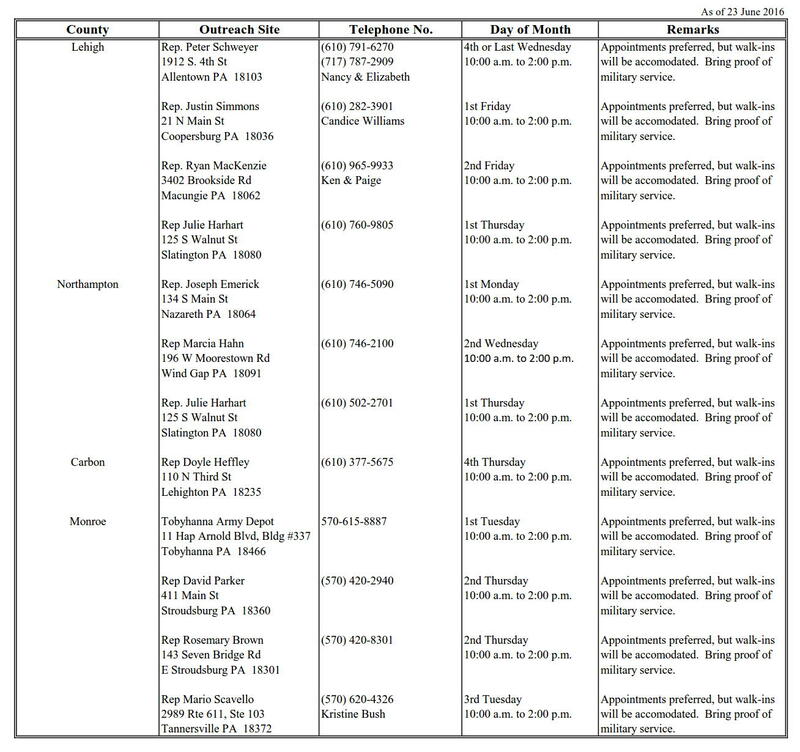 These state-employed, veterans service officers tend to be hole up at the Philadelphia and Pittsburgh VA Regional Offices and Ft. Indiantown Gap (OVA is part of the National Guard establishment there). They no longer provide a service officer twice a month to the Allentown VA Clinic. As a result, State Service Officers are generally of little use to you as an individual, unless your organization happens to request they come to Lehigh Valley as part of their new mobile outreach van service started in 2013, a service originally intended for more remote areas where other service officers are unable tread. Many parts of the Lehigh Valley fit this criterion. If interested in scheduling an outreach van, contact Tom Yadlosky, tel: 717-861-8905 or use its website to apply. Lehigh County – Thomas Applebach, tel: 610-782-3295; his assistants Vi Hertzog (nee Wagner) and Lynn Weimer are also accredited. Also appear at Allentown Outpatient Clinic on Friday mornings. Northampton County – Freddie Ramirez, tel: 610-829-4877 (new number replacing 601-559-3199). For additional information and to locate other county directors of veterans affairs, click here. Veterans Service Organizations play an important role as advocates; and especially when a problem with a government agency exists. Below are accredited Veterans Service Officers who come into the Lehigh and Northampton counties and serve veterans regardless of whether or not they belong to the service officers’ organizations. There is no requirement by law to join a service organization to receive service officer assistance. It is best to call first to ensure the service officer will be there. Most appear by 9 a.m. and leave by 2 or 3 p.m. Some will take appointments. All accept walk-ins. AMVETS: Jose L(ouis) Monterrosa, tel: 717-865-9982 on Wednesdays. DAV (Disabled Amerian Veterans): No longer sends a service officer to the clinics in our area. Miltary Order of the Purple Heart: William Jones, tel: 215-381-3064, is at the Allentown Outpatient Clinic on first and third Thursdays of the month. VFW (Veterans of Foreign Wars): Luis Ybarra, tel: 570-821-2535/ 2506, is at Allentown Outpatient Clinic on second and fourth Mondays and Thursdays of the month and at the Bangor (Northampton) Clinic on second and fourth Wednesdays of the month. The servicing Philadelphia VA Regional Office provides a near-equivalent service to that performed by county directors and veterans service officers for benefits counseling and filing of claims at the Allentown Clinic, if you desire to use the VA directly instead of an “advocate organization” — which we consider a better option for most. Call first. Al Pritchard (until recently a VFW accredited service officer), Veterans Benefits Administration VBC, tel: 570-821-2504 (tel: 610-776-4315 when at the Allentown Outpatient Clinic) on every Tuesday. In addition to occasionally calling your claims service officer or the VA by phone, you can now check on your claim’s status for yourself using eBenefits, or you can use fill out a question form on the VA’s website (Inquiry Information and Routing System). Click here for more information and to do either. Nothing replaces a current, competent, accredited veterans service officer for filing a claim. Studies show that one is more likely to succeed and draw higher compensation using one. However, understanding the system better does not hurt. TurboTaps provides a handbook as do some others. See Transition and Benefits Knowledge 101.